The Hiranandani Communities have always been known to be an astute and commendable real estate developer in our country. They had recently launched the premium residential villa plots known as ‘Hiranandani Tierra’ within the heart of its elite mixed-use integrated township known as the Hiranandani Parks which is located amidst four hundred acres of land in Oragadam, Chennai. With the Hiranandani Parks Tierra Plots, one can get exceptional plots in Oragadam which are as excellent as they are valuable. The locality of Oragadam has always been known to be a constantly booming area in the Chennai region because of its closeness and proximity to a lot of the industrial setups in its surroundings. To meet the ever-increasing demand of villa plots from home buyers who seek serene living in lieu of Apartmental surroundings, the Hiranandani Communities (spearheaded by Dr. Niranjan Hiranandani) announced the launch of its second phase of 35 acres of villa plots. The second phase which the Hiranandani Communities have built comprises of four hundred and fifty plots which range in size from six hundred square feet to five thousand square feet with a minimum price of INR fifteen lakh onwards. This beautiful community, which is also a mega township, is advertently located on the GST trunk road which connects two of the primary state highways of Chennai and Bangalore. The Hiranandani Parks comprises of four hundred acres of a well-planned and consciously thought out township with the stupendous quality of amenities, sports facilities and it’s civic infrastructure is well beyond par and supreme. If you are looking to buy a villa plot within the uber Hiranandani Township, it can be assured that it is certainly a win-win situation and offer for the person who wants to own a piece of land and build their dream villa. Villas are always classy and are certainly more so than apartments are in this regard. This layout is registered under RERA ACT, implemented by the government, and are approved by the DTCP authorities which is also a governmental organization within the state. 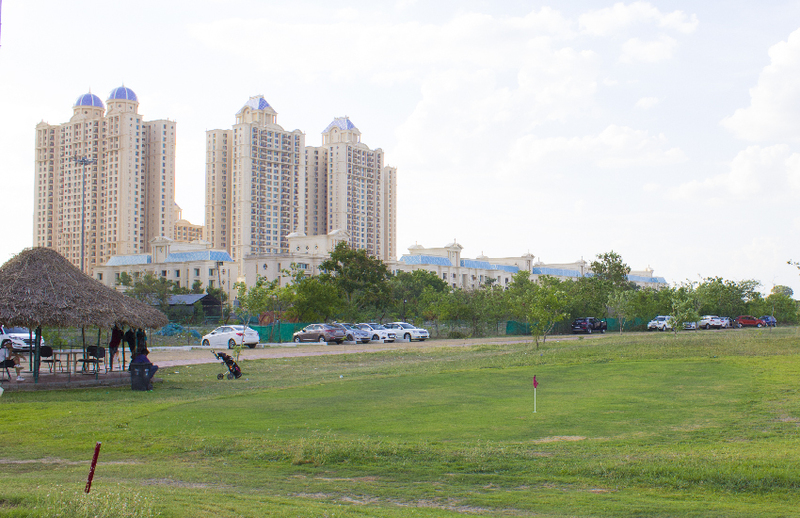 The villa plot layout is located within the centre of the township surrounded by premium sports amenities, high rise majestic towers, retail and commercial spaces. Some of the premium and world-class sports amenities within the magnificent Hiranandani Parks include: A 9-Hole Golf Range, a full-sized cricket ground, a tennis court, a squash court, a football ground filled with seating capacities, an outdoor basketball court and a volleyball court. The plotted development, that is the Hiranandani Parks, offers all common infrastructures like light, water and storm water connection as available facilities. This is done through their magnificent plug and play concept, which implies that each and every inhabitant in the location’s requirements are sorted out. The pre-laid infrastructure, fully functional township amenities, and sports facilities makes the plots ‘ready to register’ allowing the owner the option of immediate registration of the piece of land, and hence, there’s no waiting for your dream of purchasing and owning your own plot of land! As an owner of this super-premium plot, one can both withhold the plot as an investment instrument and reap the benefits of land appreciation, or take the fairly travelled down road of having the option of constructing the villa and residing within the vibrant township and avail the holistic premium lifestyle that the Hiranandani Communities is commonly known for. As a value-added service, the project offers plans for a customized villa in terms of design and construction, built as per the Hiranandani ‘neoclassical architecture’ design. Apart from the modern and ultra world class infrastructure that has been allocated for the individual plots, the project infrastructure for plotted development, the Hiranandani Tierra at the Hiranandani Parks, Oragadam includes: EB connection; sewage connection; storm water drain; telecommunication connection; beautiful paved roads and connectivity to water treatment plant, and as mentioned before, all of these services come under the magnificent scheme known as the ‘plug and play’ service, which each and every person who lives here can avail at no extra costs whatsoever. What makes living in Hiranandani Parks an exceptional experience? “This mega township is planned with amenities nestled within open green spaces,” says Dr. Niranjan Hiranandani. Wake up in the morning to the sweet sound of birds chirping. Stroll barefoot on the lush green lawns. Take a dip in the swimming pool or work up a sweat in the gymnasium – the choices are aplenty. Oragadam is a well-known industrial area on the outskirts of Chennai city. It is known as the biggest automobile hub in Southeast Asia. With over 22 fortune 500 companies, the Sriperumbudur–Oragadam belt has seen tremendous industrial growth. Oragadam enjoys good connectivity via state highways and a commendable railway system. We hope you had a great time reading this article. Do let us know your thoughts and queries in the comments section down below. And, as always, do stay tuned for more interesting content.